X-Men and Inhumans. X-Men and Avengers. Crossovers are an obvious fit for the ragtag band of mutants. But I can’t say I’ve ever seen this one before. Starting to January 2018, the “Poison X” crossover, starting in “X-Men Blue Annual #1", will see the symbiote-bonded Eddie Brock team up with X Men Blue’s team of unstuck-in-time OG X-Men (Jean Grey, Cyclops, Iceman, Beast, & Angel) to fight a crew of Poisons, the interdimensional villains that can absorb symbiotes for power and profit. While an unlikely narrative fit, this crossover makes creative sense. 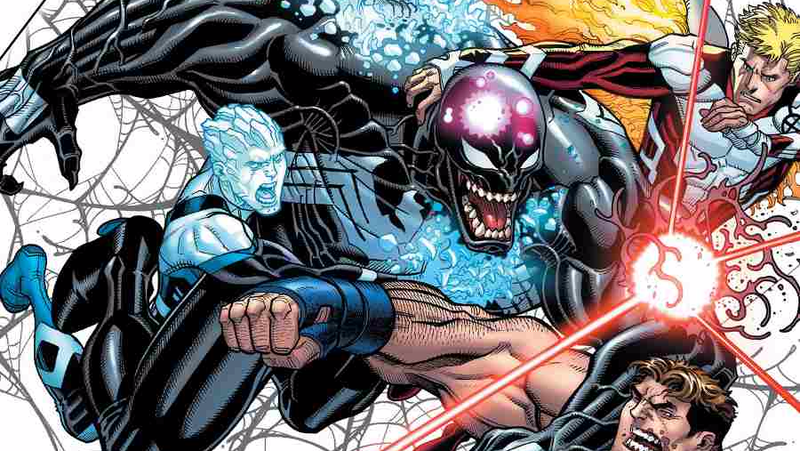 The current writer on X-Men Blue is Cullen Bunn, who helmed the Venomverse crossover event that introduced the Poisons (and a bunch of alternate universe symbiote-bonded heroes and villains) and who used to write for the main Venom book. The “Poison X” crossover will last for six issues, starting in January. Art for the first issue will be done by Edgar Salazar (Uncanny X-Men), with a cover by Nick Bradshaw (Venomverse).